"Piper Cub" redirects here. For for the earlier Taylor design, see Taylor Cub. The Piper J-3 Cub is an American light aircraft that was built between 1937 and 1947 by Piper Aircraft. The aircraft has a simple, lightweight design which gives it good low-speed handling properties and short-field performance. The Cub is Piper Aircraft's most-produced model, with nearly 20,000 built in the United States. Its simplicity, affordability and popularity invokes comparisons to the Ford Model T automobile. The aircraft is a high-wing, strut-braced monoplane with a large-area rectangular wing. It is most often powered by an air-cooled, flat-4 piston engine driving a fixed-pitch propeller. Its fuselage is a welded steel frame covered in fabric, seating two people in tandem. The Cub was originally intended as a trainer and had great popularity in this role and as a general aviation aircraft. Due to its performance, it was well suited for a variety of military uses such as reconnaissance, liaison and ground control. It was produced in large numbers during World War II as the L-4 Grasshopper. Many Cubs are still flying today. Notably, Cubs are highly prized as bush aircraft. The aircraft's standard chrome yellow paint has come to be known as "Cub Yellow" or "Lock Haven Yellow". Although sales were initially slow, about 1,200 J-2s were produced before a fire in the Piper factory, a former silk mill in Bradford, Pennsylvania, ended its production in 1938. After Piper moved his company from Bradford to Lock Haven, PA; the J-3, which featured further changes by Jamouneau, replaced the J-2. The changes mostly amounted to integrating the vertical fin of the tail into the rear fuselage structure and covering it simultaneously with each of the fuselage's sides, changing the rearmost side window's shape to a smoothly curved half-oval outline and placing a true steerable tailwheel at the rear end of the J-2's leaf spring-style tailskid, linked for its steering function to the lower end of the rudder with springs and lightweight chains to either end of a double-ended rudder control horn. Powered by a 40 hp (30 kW) engine, in 1938, it sold for just over $1,000. The outbreak of hostilities in Europe in 1939, along with the growing realization that the United States might soon be drawn into World War II, resulted in the formation of the Civilian Pilot Training Program (CPTP). The Piper J-3 Cub became the primary trainer aircraft of the CPTP and played an integral role in its success, achieving legendary status. About 75% of all new pilots in the CPTP (from a total of 435,165 graduates) were trained in Cubs. By war's end, 80% of all United States military pilots had received their initial flight training in Piper Cubs. Prior to the United States entering World War II, J-3s were part of a fund-raising program to support the United Kingdom. Billed as a Flitfire, a Piper Cub J3 bearing Royal Air Force insignia was donated by W. T. Piper and Franklin Motors to the RAF Benevolent Fund to be raffled off. Piper distributors nationwide were encouraged to do the same. On April 29, 1941, all 48 Flitfire aircraft, one for each of the 48 states that made up the country at that time, flew into La Guardia Field for a dedication and fundraising event which included Royal Navy officers from the battleship HMS Malaya, in New York for repairs, as honored guests. At least three of the original Flitfires have been restored to their original silver-doped finish. The Piper Cub quickly became a familiar sight. First Lady Eleanor Roosevelt took a flight in a J-3 Cub, posing for a series of publicity photos to help promote the CPTP. Newsreels and newspapers of the era often featured images of wartime leaders, such as Generals Dwight Eisenhower, George Patton and George Marshall, flying around European battlefields in Piper Cubs. Civilian-owned Cubs joined the war effort as part of the newly formed Civil Air Patrol, patrolling the Eastern Seaboard and Gulf Coast in a constant search for German U-boats and survivors of U-boat attacks. Piper developed a military variant ("All we had to do," Bill Jr. is quoted as saying, "was paint the Cub olive drab to produce a military airplane"), variously designated as the O-59 (1941), L-4 (after April 1942) and NE (U.S. Navy). The L-4 Grasshopper was mechanically identical to the J-3 civilian Cub, but was distinguishable by the use of a Plexiglas greenhouse skylight and rear windows for improved visibility, much like the Taylorcraft L-2 and Aeronca L-3 also in use with the US armed forces. It had accommodations for a single passenger in addition to the pilot. When carrying only the pilot, the L-4 had a top speed of 85 mph (137 km/h), a cruise speed of 75 mph (121 km/h), a service ceiling of 12,000 ft (3,658 m), a stall speed of 38 mph (61 km/h), an endurance of three hours, and a range of 225 mi (362 km). Some 5,413 L-4s were produced for U.S. forces, including 250 built for the U.S. Navy under contract as the NE-1 and NE-2. All L-4 models, as well as similar, tandem-cockpit accommodation aircraft from Aeronca and Taylorcraft, were collectively nicknamed "Grasshoppers", though the L-4 was almost universally referred to by its civilian designation of Cub. The L-4 was used extensively in World War II for reconnaissance, transporting supplies, artillery spotting duties and medical evacuation of wounded soldiers. During the Allied invasion of France in June 1944, the L-4's slow cruising speed and low-level maneuverability — alongside examples of the Auster AOP aircraft occasionally used by the British Army and other Commonwealth forces for the same purposes — made it an ideal observation platform for spotting hidden German armor waiting in ambush in the hedgerowed bocage country south of the invasion beaches. For these operations, the pilot generally carried both an observer/radio operator and a 25-pound communications radio, a load that often exceeded the plane's specified weight capacity. After the Allied breakout in France, L-4s were also sometimes equipped with improvised racks, usually in pairs or quartets, of infantry bazookas for ground attack (actually a form of top attack) against German armored units. The most famous of these L-4 ground attack planes was Rosie the Rocketer, piloted by Maj. Charles "Bazooka Charlie" Carpenter, whose six bazooka rocket launchers were credited with eliminating six enemy tanks and several armored cars during its wartime service, especially during the Battle of Arracourt. After the war, many L-4s were sold as surplus, but a considerable number were retained in service. L-4s sold as surplus in the U.S. were redesignated as J-3s, but often retained their wartime glazing and paint. An icon of the era and of American general aviation in general, the J-3 Cub has long been loved by pilots and nonpilots alike, with thousands still in use today. Piper sold 19,073 J-3s between 1938 and 1947, the majority of them L-4s and other military variants. After the war, thousands of Grasshoppers were civilian-registered under the designation J-3. Hundreds of Cubs were assembled from parts in Canada (by Cub Aircraft as the Cub Prospector), Denmark and Argentina and by a licensee in Oklahoma. In the late 1940s, the J-3 was replaced by the Piper PA-11 Cub Special (1,500 produced), the first Piper Cub version to have a fully enclosed cowling for its powerplant and then the Piper PA-18 Super Cub, which Piper produced until 1981 when it sold the rights to WTA Inc. 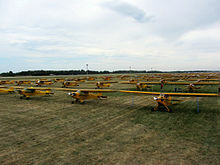 In all, Piper produced 2,650 Super Cubs. The Super Cub had a 150 hp (110 kW) engine which increased its top speed to 130 mph (210 km/h); its range was 460 miles (740 km). The L-4 was used extensively by both U.S. and South Korean Air Forces in the early 1950s. During the Korean War, the L-4 was in service in many of the same roles it had performed during World War II, such as artillery spotting, forward air control and reconnaissance. Some L-4s were fitted with a high-back canopy to carry a single stretcher for medical evacuation of wounded soldiers. Modernized and up-engined versions are produced today by Cub Crafters of Washington and by American Legend Aircraft in Texas, as the Cub continues to be sought after by bush pilots for its short takeoff and landing (STOL) capabilities, as well as by recreational pilots for its nostalgia appeal. The new aircraft are actually modeled on the PA-11, though the Legend company does sell an open-cowl version with the cylinder heads exposed, like the J-3 Cub. An electrical system is standard from both manufacturers. The J-3 is distinguished from its successors by having a cowl that exposes its engine's cylinder heads — the exposed cylinders of any J-3's engine were usually fitted with sheet metal "eyebrow" air scoops to direct air over the cylinder's fins for more effective engine cooling in flight. Very few other examples exist of "flat" aircraft engine installations (as opposed to radial engines) in which the cylinder heads are exposed. From the PA-11 on through the present Super Cub models, the cowling surrounds the cylinder heads. A curiosity of the J-3 is that when it is flown solo, the lone pilot normally occupies the rear seat for proper balance, to balance the fuel tank located at the firewall. Starting with the PA-11, as well as some L-4s, fuel was carried in wing tanks, allowing the pilot to fly solo from the front seat. Variant with slotted flaps powered by a 65 hp (48 kW) Lenape LM-3-65 engine. 1944 variant with cantilever wing powered by a 65 hp (48 kW) Continental A-65-8 engine. Five L-4 Cubs converted by Jean Poullin for specialist tasks. United States Navy designation for three TG-8s received. The aircraft has been popular with flying schools — especially from the pre-World War II existence of the Civilian Pilot Training Program using them in the United States — and remains so with private individuals, into the 21st century. ^ Lord, Magnus (April 2008). "The story of Cub Yellow". Retrieved 2008-09-15. ^ "Piper J-3". Aircraft of the Smithsonian. Archived from the original on 2006-03-03. Retrieved 2006-04-02. ^ a b Spence, Charles (23 September 1997). "They're not all Piper Cubs". Aviation History. Retrieved 2011-09-06. ^ a b c d e f Federal Aviation Administration (August 2006). "AIRCRAFT SPECIFICATION NO. A-691" (PDF). Retrieved 2010-02-15. ^ a b c d e f g Federal Aviation Administration (August 2006). "AIRCRAFT SPECIFICATION NO. A-692" (PDF). Retrieved 2010-02-15. ^ a b c d e Federal Aviation Administration (August 2006). "AIRCRAFT SPECIFICATION A-698" (PDF). Retrieved 2010-02-15. ^ a b Federal Aviation Administration (October 1942). "Approved Type Certificate 695" (PDF). Retrieved 2010-02-18. ^ a b c Guillemette, Roger. "The Piper Cub". US Centennial of Flight Commission. Archived from the original on 2010-11-21. Retrieved 2006-04-02. ^ "Shindig at N.Y. Airport Opens Fund Drive for R.A.F". Life: 36. 12 May 1941. ^ "Civil Air Patrol". Air Force Link. 27 November 2006. Archived from the original on 15 March 2008. ^ Ames, Drew (April 2007). "Guarding the home skies". America in WWII. 310 Publishing. ISSN 1554-5296. Retrieved 3 October 2008. ^ Federal Aviation Administration (October 1939). "Approved Type Certificate 660" (PDF). Retrieved 2010-02-15. ^ "Cammandre 1". Retrieved 2011-02-07. ^ a b Gaillard, Pierre (1990). Les Avions Francais de 1944 a 1964 (in French). Paris: Editions EPA. ISBN 2 85120 350 9. Gaillard, Pierre (1990). Les Avions Francais de 1944 a 1964 (in French). Paris: Editions EPA. ISBN 2 85120 350 9. 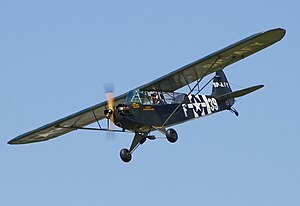 Wikimedia Commons has media related to Piper Cub. This page was last edited on 9 March 2019, at 12:33 (UTC).